"IDC and Strategy Analytics today officially confirmed what was unofficially revealed last week: Apple has ousted Nokia as the largest smartphone maker in the world. 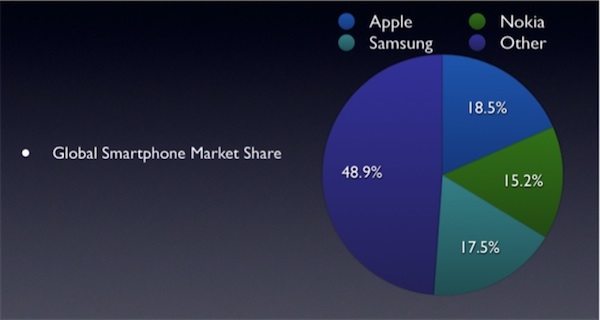 20.3 million iPhones last quarter, which means they were up 142% from last year. This puts Apple's iPhone at 18.5% marketshare besting Nokia's 15.2% marketshare (a drop off of about 50% from last year). Yes, all of this with a single phone. For this quarter anyway.